Bon siman tur hende apresiá. 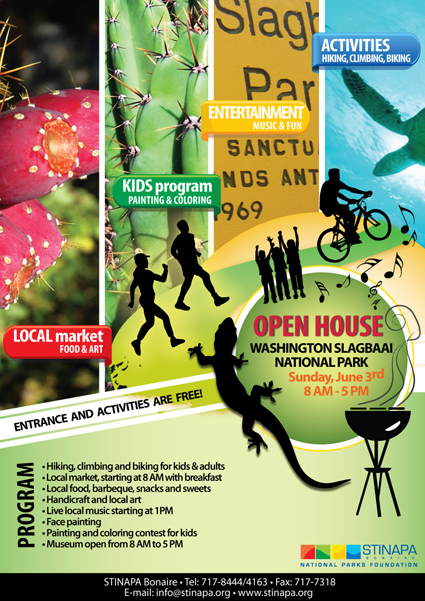 I would like to invite you all to the Open House of the Washington Park this Sunday June 3rd. At the entrance there will be stalls with local food, art, handicraft and treats. The roads have been scraped so you can drive through the park with any type of vehicle (which has a spare tire) and enjoy the nature. It is nice and green after the rain fall of a couple of weeks ago. Go to Slagbaai and enjoy the beauty of the historical buildings there. Can back to the entrance and end the day dancing with music of local musicians. More information is in the attachment. Forward this invitation to all your friends and collegues at work. Pasa e invitashon aki pa tur boso amistatnan I koleganan di trabou. Stuur deze uitnodiging door naar al jullie vrienden, kennisen en collegas op werk. I just had a whirlwind week of dining bliss. I had some friends on island so I was sort of a tourist indulging on at some favorite locations as well as revisiting a few spots I have missed over the years. My neighbor treated me to Mother’s Day lunch at Kontiki. 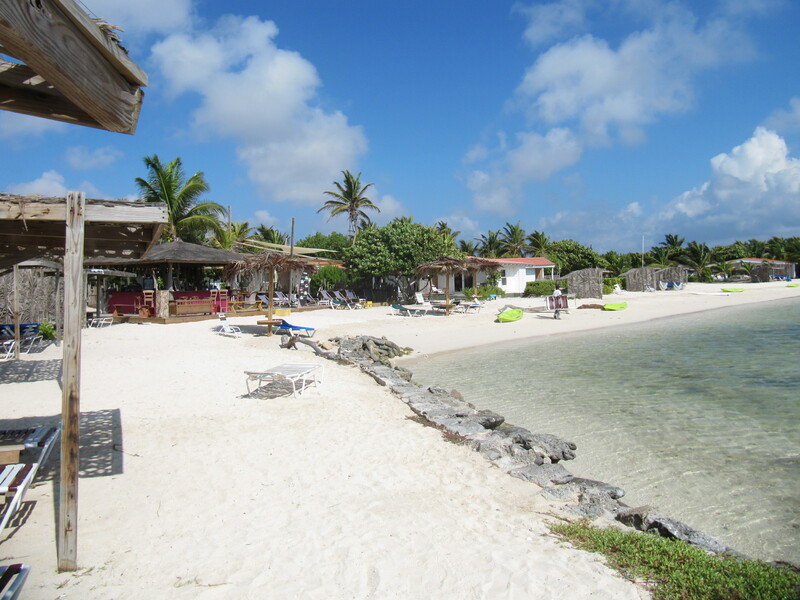 This is one of my favorite Bonaire lunch spots with stellar views of Lac Bay. We enjoyed the fresh fish being served that day. 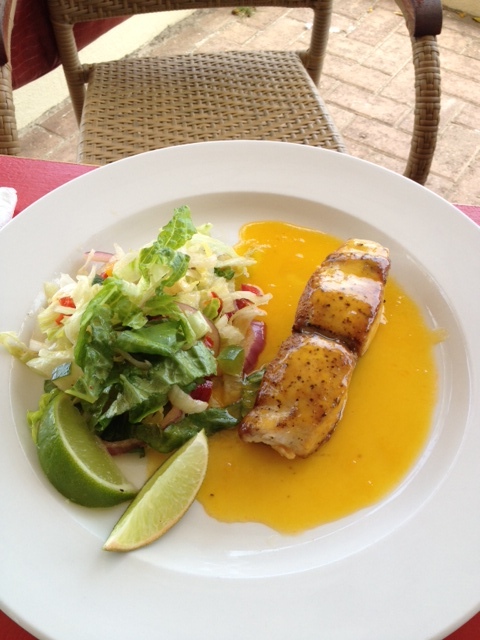 The hit was the fresh Mahi Mahi in a mango sauce. Of course the freshly made Pina Colada hit the spot. I had a lovely dessert later at Gio’s Gelato on Kaya Grandi. Honestly, this is as good as it gets. The selection is staggering including pistachio and tiramisu. If you are craving something sweet and delicious, look no more. My friend invited me to girl’s night at La Barca. I had frequented this oceanview restaurant a few years back and returned last week for an amazing dinner. This al fresco spot offers homemade pasta and fresh fish. I spoke to the chef and asked him to create a pasta seafood dish. He wowed me with an amazing puntanesca style concoction. It was sublime. I cannot wait to return. As mentioned in a previous post, Patrice from Bistro de Paris has moved his location to the marina side venue at Harbour Village. My friend and I dined at Zazu, the lovely bar on side. Patrice has created an amazing menu for those wishing to enjoy a lighter fare. I sampled the Vietnamese Spring Rolls and the Brie and Spinach Crepe. Both were amazing and delectable. As we dined, the local fisherman came in with two lovely fresh Mahi Mahi. This is a not to miss spot. I highly recommend the Ti Punch. I am pleased to offer free on island Concierge to all of my discerning guests. Allow the opportunity to reserve your table today and soon, embarking on Bonaire’s dining bliss. Kralendijk, Bonaire – The “Bonaire Reef Pilot Project” was born when Ken Nedimeyer’s Coral Restoration Foundation (CRF) was invited to visit the island by Buddy Dive Resort to work with and assist Bonaire with their continued efforts to preserve Bonaire’s greatest assets, its reefs. The project centered on the restoration of the shallow reefs by establishing a nursery and restoration program designed to cultivate staghorn and elkhorn corals and for this purpose the Coral Restoration Foundation Bonaire was established. “We’re very fortunate to be working with CRF and to be able to combine our efforts to preserve the current genetic diversity of our staghorn and elkhorn corals. Given the fact that Bonaire is world renown for having some of the healthiest reefs in the Caribbean, it’s the ideal place for this project to prosper and in turn encourage other islands to follow suit,” commented Anja Romeijnders, President of Tourism Corporation Bonaire. “Coral restoration is a very important part of revitalizing the marine environment and we are proud to be taking the first steps towards accomplishing this task,” Mrs. Romeijnders continued. In addition to working with local scientists to identify specific sites for coral nurseries and reef outplantings, CRF will collect different genetic strains of staghorn and elkhorn coral, that will be used to populate coral growing trees in two coral nurseries. These corals will be monitored and maintained by the local support group trained by CRF and will form the base nursery stock that will be fragmented every six months to develop second and third generation corals in each genetic subgroup. In late 2013, these second and third generation corals will be taken from the nursery and planted back on the reefs. Located eighty-six miles east of Aruba, the Dutch Caribbean island of Bonaire offers year-round sunshine, low annual rainfall, pristine coral formations and the most thriving fish population in the Caribbean. Ideal for adventurers, explorers and sun-worshippers alike, Bonaire offers myriad eco-adventure activities including world renowned scuba diving and snorkeling, windsurfing, kiteboarding, mountain biking, sea and mangrove kayaking, horseback riding, nature tours, hiking, bird watching, sailing and deep sea and bone fishing. And with a selection of accommodations ranging from full-service oceanfront resorts and condominiums to guesthouses and small inns, Bonaire has something for every lifestyle and budget. Bonaire is the recipient of the prestigious Islands Magazine/Caribbean Tourism Organization 2008 Sustainable Tourism Award and continues to be recognized as one of the top destinations worldwide for its sustainable tourism. It was designated by the National Oceanic and Atmospheric Administration (NOAA) as having the healthiest reefs in the Caribbean (January 2008) and in 2011, Bonaire was voted one of the top five Snorkeling Destinations in the Caribbean by the editors of Caribbean Travel & Life. For 19 consecutive years in Scuba Diving magazine’s annual Readers’ Choice Awards, Bonaire has been selected as the number one Shore Diving destination in the Caribbean/Atlantic. This year, it was voted one of the Best Destinations Overall, number one for Marine and Macro life, and for Snorkeling also in the Reader’s Choice Awards. We had nuking May winds this weekend. 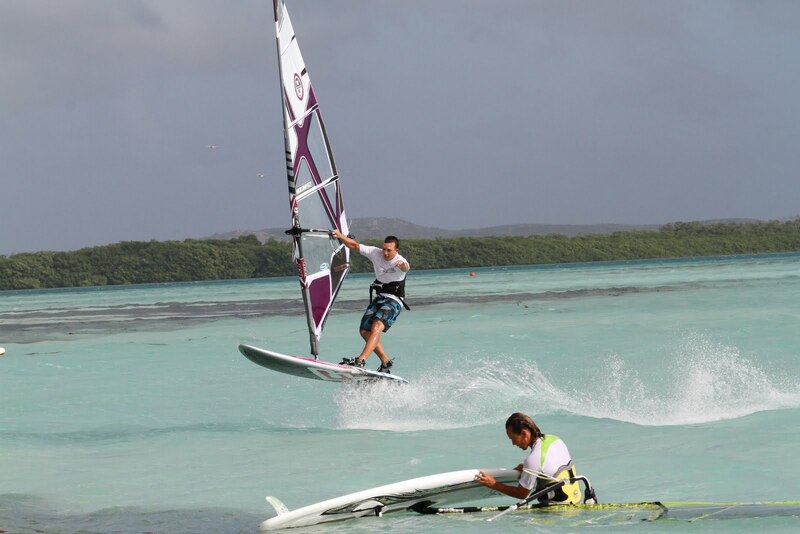 May typically has amazing trades but I can remember the last PWA event I ran with the Bonaire team. There was NO wind in fact Lac Bay was completely shallow. I digress, this weekend it rocked. I was way overpowered on a Neil Pryde 4.5 that I borrowed from Jibe City (my 4.2 Gun Sail was put to rest). I used my faithful beat up 87 liter Angulo Chango and sailed to my heart’s content. It was really choppy and some high gusts made it slightly insane but it was a lovely time on pristine Lac Bay. Today I rested a bit and head off to the Massage Hut for a little body work. The Boston posse is in town and loving the winds. My two very special clients, Andrew and Ben, West Dennis sailors are being treated to a dose of healthy sailing. Sorobon Beach Resort is celebrating spring with some super specials. This unique rustic beachfront Caribbean style property is smack dab on windy Lac Bay. 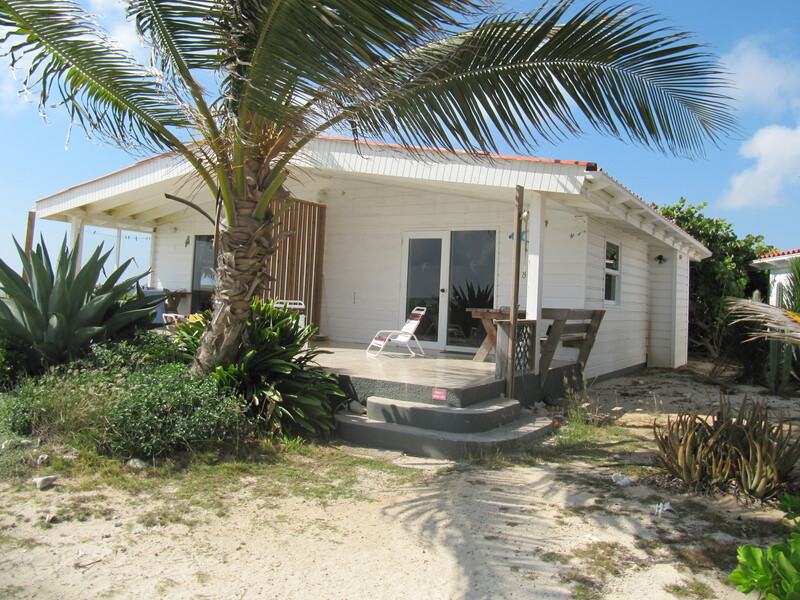 This is the perfect spot for windsurfers and snorkelers.The specials are valid for stays between May 12 and June 29, 2012 and apply to new bookings made with Caribbean Wind & Sun Vacations.Rates are per person in US$ and include 7 nights accommodation in a 1 bedroom chalet based on double occupancy. Restrictions apply. 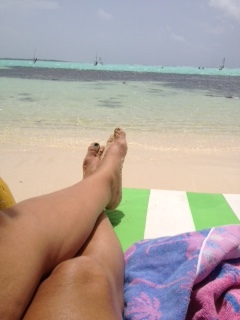 Contact Caribbean Wind &Sun at ann@bonairecaribbean.com or call 001 508 737 5245 in the US or 011 599 786 3134 in Bonaire. Free Concierge Services are included with all bookings! 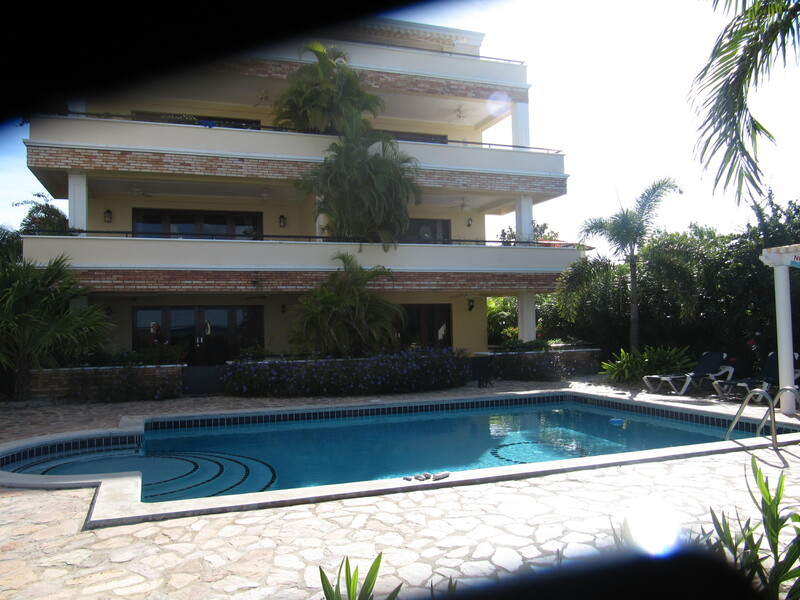 I am thrilled to offer a brand new listing at Playa Lechi Residence. The penthouse is a luxury unit with stellar views of Klein Bonaire and the harbour of Kralendijk. Swim in your refreshing seaside pool, stroll the oceanfront promenade or take in the view from your private balcony. The unit is modern and bright and the perfect escape for a family or 3 couples. Contact ann@bonairecaribbean.com for details.